Don’t Become a Victim of Airport Transfer Scams and taken for a ride by Fake and Impostor websites in Rome that copy legitimate companies’ names to dupe and mislead tourists. Copycat websites are not new in the World Wide Web we’ve come to depend on for so much. It’s even more devious when it hits international tourists who don’t know the difference between honest and shady companies abroad. Human nature tends to be trusting, after all, if a someone creates a website, provides a service for a fee, and there is no scandal that surrounds them online, it means they are genuinely operating a sound business. That’s not always the case. Many companies have invested so much over the years to establish themselves as reliable, recommended and trusted in the industry. Like us, many have cemented a name for themselves based on their sound reputation for operating an honest and dependable business travelers have come to trust and rely on. That’s when fly-by-night unknowns appear on the scene with names and websites very similar to existing companies, and this often confuse travelers in booking with them. How do they do this? They use website names suspiciously similar to the established company they’re targeting. One example of such practice is, for instance, when you google Rome Cabs, in addition to the official and ONLY Rome Cabs website: www.RomeCabs.com, you will find websites that use variations and added words like transfer or booking after RomeCabs. Or they employed SEO techinques so their website headliner may read Rome Cab or RomeCabs, but their website address is something completely different! Always compare the website address to the headliner. Other scam artists spend money on Google adwords and use our company name in the header to mislead clients thinking we are them! Some also create email addresses bearing the same name or suspiciously similar as the company they target….with a @hotmail, @gmail, @yahoo, or any other variations at the end. People who don’t know the difference can be easily mislead and confused. When the name of the company, their website address and content do not match, be aware. HOW DO YOU PROTECT YOURSELVES FROM ONLINE IMPOSTORS and UNRELIABLE COMPANIES? There are ways to protect yourself from becoming a victim of unscrupulous online companies. * ALWAYS book your service with established companies that come highly recommended by sources you trust. When it comes to your and your loved ones’ safety, you should not leave anything to chance. * NEVER blindly google or search the company name online to obtain their website. This is what copycat websites are counting on because here is where people become confused. The title tag above the website can be influenced by key words, and it may not represent the actual company name. * ALWAYS make sure you have the correct company website address. When you ask for recommendations, make sure you also receive the website address along with the company name. * ALWAYS contact the company by typing in their official website on your browser, never based on a search engine search. these usually signs that you may be on the wrong website and if you may unintentionally book with the wrong company. * NEVER book your car service based on cheap and deeply discounted prices. The way most fly-by-night and impostor websites get clients is by offering very low prices compared to most established companies who invest in quality and safe service. . Please know that when it comes to private car service you really do get what you pay for. A responsible car service company in Rome cannot survive offering cheap and deeply discounted prices below market value without cutting dangerous corners on vehicle safety and proper maintenance, insurance, quality of service, or even breaking laws. When you are booking car service online from unknown companies and websites offering cheap prices, you can get taken for a ride in more ways than one, and worse: you can potentially put your personal safety at risk! We have received untold number of calls from desperate travelers stranded at the airport or the cruise port (many of them elderly) because their drivers never showed up. In all these cases, they booked service via cheap copy-cat websites thinking they booked with the REAL Rome Cabs. Fly-by-night and copycat websites typically have nothing to lose since they do not depend on their reputation and word of mouth for their business. They often operate on multiple websites, so if they garner enough bad reputation online via one website, they simply shut it down and open another. Don’t become a victim of online impostors and unscrupulous companies no matter what type of service you are seeking, protect yourselves and your loved ones on your trips abroad. After all, safety first! There are many honest, established and reputable companies to chose from, so which ever company you select to book with, do so only after careful consideration based on reliable information, and with diligence in making sure you are booking with the intended company. For more information on Rome Cabs Transfer to the Airport and Civitavecchia, Tours, and Shore Excursions from Italy’s top Ports of Call, please visit us at www.RomeCabs.com. Do you have any tips to share that helps travelers abroad? We’d love to hear from you in the comments box below. Sharing is fun: If you found this article helpful, please pass it along to anyone who might benefit from it. We thank you for visiting our blog, and we look forward to being of service to you in the future. See you soon in Italy! Buon giorno and welcome to Stefano’s RomeCabs, Rome’s leading company for private Shore Excursions from Civitavecchia, as well as Port Transfers and Day Tours through Italy. We have been providing reliable quality shore excursions from Civitavecchia for more than 15 years, and we’d like to share with you our TOP 5 Cruisers’ Choice Shore Excursions from Civitavecchia with RomeCabs that our cruising clients have requested and booked the most. Below are the tours, along with descriptions, photos and videos to help you choose the tour best suited for you and your family. On all our shore excursions, your personal English speaking Driver will meet you on the Pier next to your ship in the morning, and following your tour by car will conveniently drop you off right back on the pier next to your ship again. ALL the tours below are also offered as a Day Tour from Rome hotel for cruisers who are staying in Rome pre cruise or post cruise, as a Shore Excursion for cruisers docking in Civitavecchia just for the day, and a Post Cruise Tour option with pick up from Civitavecchia and drop off hotels in Rome or Fiumicino. Rome in A Day is by far THE most popular shore excursion from Civitavecchia as well as day tour from Rome for cruisers spending time in Rome pre cruise or post cruise. Cruisers who book this tour wish to visit and experience the “must sees” and we make it possible on our Rome in a Day tour! The Vatican – prepare to be amazed by the treasure trove of art inside the vast Vatican Museums, Michelangelo’s masterpieces inside the Sistine Chapel, and the wonders of St Peter’s Basilica. Panoramic Rome for Cruisers offers a panorama of the Eternal City with a taste of Rome’s highlights and a few surprises. This popular tour was created in response to increasing demand from cruisers requesting a more relaxing tour, avoid highly crowded places such as the Vatican Museums and Colosseum, and have flexibility without advance purchased non-refundable tickets with strict time slots (again, such as the Vatican Museums and Colosseum). This tour is also an excellent option on the 1st Sunday of the Month when it’s not possible to visit the Vatican Museums as they are closed and the Colosseum has free entrance which results in hours’ long wait in long lines. Piazza della Rotonda with the monumental breathtaking Pantheon. Enjoy a taste of La Dolce Vita with visits to Rome’s most popular and lively squares: Trevi Fountain, Spanish Steps, and Piazza Navona. A visit to the 12th century Basilica of San Clemente will surprise you with an underground journey back in time to Ancient Rome as you peel off the layers of Rome’s 2,000 year old history. On this amazing underground journey you will explore an early 4th century church upon which the current one was built, and further below the remains of a 3rd century ancient Roman apartment complex with a Mythraic temple dedicated to Mithras – an ancient Roman pre-Christianity cult. Vacanze Romane / Roman Holiday Tour evokes nostalgic sentiments of the old classic movies that still live in our hearts. Roman Holiday is one of the many unforgettable classics filmed in Rome (another that has captured our hearts is La Dolce Vita). Our sister company Stefano Rome Tours has created a FUNtastic Rome tour that takes you many of the famous locations in the 1953 movie Vacanze Romane / Roman Holiday starring Audrey Hepburn and Gregory Peck. A visit to the Colosseum to explore the colossal ancient Roman amphitheater. A drive through Piazza Venezia will take you to Capitoline Hill for a picture perfect view of the Roman Forum. You will continue your drive past Teatro Marcello to the church of Santa Maria in Cosmedin to see the Mouth of Truth (Bocca della Verita). If you don’t mind the line, you can have your own pictures taken infamously putting your hand inside the mouth of truth and hope it won’t bite you should you telling a lie! A stop for a stroll along the beautiful Ponte Sant’Angelo bridge that’s next to Castel Sant’Angelo – the mausoleum of ancient Roman emperor Hadrian that was later converted into a medieval fortress, a prison and then a castle with ornate quarters. Trevi Fountain has been featured in so many classic movies that it most definitely merits a visit, along with the elegant Spanish Steps. No movie buff would miss the opportunity to stroll along Via Margutta – the street made famous as the actual address of Gregory Peck’s character: Via Margutta 51. It’s a quiet, pristine, charming oasis in the middle of a chaotic city. Last and not least, a visit to the fabulous Pantheon will complete your Vacanze Romane / Roman Holiday tour. Ancient Rome history buffs frequently choose our Seven Wonders of Ancient Rome Tour for the wonderful experience of exploring ancient Rome’s most fascinating engineering feats we can see in their monuments, roads, buildings, aqueducts, and ruins. Your Rome tour through the Seven Wonders of Ancient Rome will first take you to the Colosseum – one of the world’s greatest examples of Roman architectural and engineering achievements. Nearby, you will see what remains of Circus Maximus, the largest chariot racing and sports arena of Ancient Rome. The Imperial Baths of Caracalla will leave you in awe as you walk through the giant structures that are all that remains from Emperor Caracalla’s massive complex that included Olympic size swimming pool, cold and hot baths, gymnasiums, Greek and Latin libraries, conference rooms, and more. You will next drive to the 4th century Ancient Appian Way – known as “Regina Longarum Viarum,” or “Queen of the Long Roads”, and one of the most important strategic roads of the Roman Republic. Segments of this ancient road are impressively well preserved so you can have an overall idea of what an ancient Roman road was like. The Park of the Aqueducts is not a regular park, but jaw dropping display of remnants of some of the seven major aqueducts of Rome that were Rome’s lifeblood, carrying water uphill and downhill for long distances. The Pantheon is always a favorite… regardless of the theme or subject of a tour. And it’s also one of the Seven Wonders of Ancient Rome, followed by Trajan’s Forum which will complete your tour. Just across the Roman Forum, Trajan’s Forum is a testament of Ancient Rome’s golden age of architectural wonders commissioned by ambitious Emperors, and overwhelmed visitors for ages. What is most visible still is Trajan’s Column (a victory column that details Trajan’s successful campaign against the Dacians – modern day Romania), and Trajan’s Market – possibly the world’s first shopping mall! Many years ago fans of the book and movie Angels and Demons, inspired our sister company Stefano Rome Tours to create this tour and offer Cruisers the opportunity to come face to face with many of the amazing locations in Rome featured in the the novel and movie. Long after the movie and book lost popularity, cruisers and travelers alike still book this tour to enjoy the locations in Rome that are wonderful to visit whether or not you are a fan of the book and movie. St. Maria della Vittoria Church (FIRE) – don’t miss Bernini’s sculpture of Ecstasy of Saint Teresa. Thank you for visiting our travel blog and reading our 5 TOP “Cruisers’ Choice” Shore Excursions from Civitavecchia – with RomeCabs article. To browse through our day tours, shore excursions from other cruise ports in Italy, and transfers, please visit our website. There’s nothing like summer in Rome: long days to enjoy more monuments, squares and museums, warm evenings for romantic dinner at an outdoor restaurant, and lots and lots of gelato! Summer is also the most popular season for travelers, who come to Rome on their summer vacations. If you are among the millions making your way to Rome in the summer, this blog can help you avoid the 3 worst mistakes that can ruin your trip to Rome. Rome is not only one of Italy’s top destinations for travelers, but also for cruisers who leave and arrive at the cruise port of Civitavecchia, and also dock for the day at the port on their cruise. By waiting too close to your trip to book your Hotel, Airport Transfers, Civitavecchia Port Transfers, Day Tours and Shore Excursions, you may discover limited availability or no availability at all. Many travelers, especially cruisers, plan their trip up to 1 year in advance and book accordingly. Summer is not the time to travel off the cuff and book what you need as you go along. Spontaneous travel is best in the off season months of November to March. So don’t wait until last minute, book everything you need for your Rome trip in advance and you’ll have nothing to worry about. The Colosseum and Vatican Museums have terribly long ticket lines that can mean long wait times that last hours and possible missed opportunities to visit these amazing places. If you are short on time, the long ticket lines can also cause you to miss out these sites altogether – and if this was your only chance to visit them, it would be a huge disappointment during your trip. In the case of the Colosseum, these wait times are right under the hot summer sun. Because the Colosseum also has a security checkpoint installed, your ticket line can be further impacted by added security lines. The Colosseum is best visited first thing in the morning when the lines are shortest. You can avoid the other security lines at Saint Peter’s Square when entering Saint Peter’s Basilica by accessing the Basilica through the Vatican Museums. Guaranteed access can only be possible when touring the Vatican Museums with a licensed tour guide in order to enter the Tour Guide reserved entrance that will take you quickly to the Basilica through the backway. You can book a private Tour of the Vatican Museums, Sistine Chapel and St Peter’s Basilica through My Rome Guides. If you book our Rome in A Day Tour, we can arrange for a licensed tour guide for your Vatican visit. You can avoid potentially long ticket lines, the stress and frustration by booking your museums and monuments tickets in advance wherever possible and skip the ticket lines. Summer attire for many travelers consists of tank tops, short sleeved or sleeveless tops, shorts or mini skirts, and flipflops. However, in Rome this can pose a problem. Many churches in Rome that are on visitors’ Must See List have a strict modesty dress code that require shoulders and knees to be covered (men, women, and older children). Visitors who do not observe the modesty dress code can be turned away. At St Peter’s Basilica they are most definitely turned away. We have seen numerous visitors wait up to 1 hour in St Peter’s Square to clear security to visit the Basilica, only to be turned away at the door because they were under dressed. For many, that was their ONLY chance to visit the Basilica as shopping for proper clothes and then return in line again was not an option as they were on a time limited shore excursion and had to return to the ship soon after. If you are planning to visit specific significant churches in Rome, either dress accordingly on those days, or bring something to cover your shoulders and knees for spontaneous church visits. Many streets and sidewalks in Rome are either cobble stoned, or are not entirely smooth (expect a few holes and uneven pavement) on these old streets. Archaeological sites like Roman Forum, Palatine Hill, Ostia Antica and others have rugged dirt terrain with loose rocks, stones and pebbles. It is imperative that you wear comfortable sandals and walking shoes in Rome to avoid damage to your feet. Leave the flip flops for the beach. When in Rome, wear footwear to keep your feet safe and comfortable. And break them in before your trip…blisters are painful to have when walking on your feet all day. We have seen far too many cracked, cut, bandaged, crippled feet and sprained ankles in Rome as a result of inadequate footwear. Don’t let your shoes ruin your vacation. While there are MORE mistakes travelers make that ruin their summer trip to Rome and Italy that we will explore later, however these are the most common ones. Thank you very much for choosing Stefano’s RomeCabs for your Transfers and Tours in Rome and Italy. We look forward to welcome you to Rome! Buon giorno and welcome to Stefano’s RomeCabs, Rome’s leading company for reliable Airport Transfers, Civitavecchia Transfers, Day Tours, and Shore Excursions. Arranging your airport or Civitavecchia port transfers is an important aspect of your travel plans. You’ll need to know how to get to your hotel in Rome from the airport and then back again, or how to get to and from your ship in Civitavecchia for your cruise. Stefano’s RomeCabs makes this process easy and seamless by providing both Airport and Civitavecchia Port Transfers so all your transfer needs are taken care of. When booking your transfers, there are some important things to keep in mind to avoid disappointments during your travels. Below we discuss the most important ones. 1 Use the Correct Arrival Date in Rome. Some travelers departing from the American continent (Canada, US, South America) incorrectly book a transfer for the date of their own departure from home, not on the day “after” when they arrive in Rome. 2 Check for Correct Flight Number for Arrivals. If you have multiple flight connections enroute, make sure that the Flight Number and Arrival Time you book your transfer from the airport is the correct ones arriving at your final destination in Rome. By double checking your flight itinerary for accuracy, you from don’t accidentally include the flight number from a previous leg in a different city or country. Be sure to provide your Hotel Name and Address with complete street number. There are many hotels in Rome, for example, that are similar by name. Having the complete address of the hotel is very important, especially for pick ups when you want your driver to arrive at the correct location to pick you up. If staying at a B&B or apartment, please provide the complete address with the exact building number. Many streets are long, and surrounded by convoluted one way systems. Knowing the street number not only helps the driver plan the route to your drop off location, but it’s vital for pick ups – without your building number it would not be possible to know your exact location. Drivers often arrive at your hotel and present themselves at the front desk as the Driver for “Name in the Transfer Reservation”. If you book your transfer and hotel under different names, your hotel concierge will not know to inform you that your driver has arrived. This is also important if the company needs to reach you by phone at your hotel with important information. 5 For Civitavecchia Transfers, be sure to include the actual Ship Name, not the Cruise Line Company. On many days there can be multiple ships docking in Civtavecchia by the same cruise line, and they dock on different piers making impossible to guess which is your ship if you only provide your cruise line instead of the actual ship name. For example: Crown Princess (not just Princess Cruises). 6 Schedule your Civitavecchia Transfers at the Right Times. If your Transfer starts from your ship in Civitavecchia and ends at your hotel in Rome, the most common pick up time most cruisers book is 9:00 AM as that is when most cruisers are disembarked by. If you schedule your pick up from your ship later than 9:00 AM, you risk disembarking earlier and have to wait on the pier for your driver to arrive for your scheduled transfer. Civitavecchia is about 1.5 hours away from Rome, if you disembark 30 – 40 minutes early, it would be possible to send the driver right earlier on the same morning as he or she is likely still enroute to Civitavecchia. From Civitavecchia to Fiumicino Airport, travel time is about 1 hour, so keep that in mind when booking your transfer from Civitavecchia to Fiumicino Airport. 7 Schedule your Transfer from Rome to the Airport at the Right Time. Travel time between Rome and Fiumicino Airport or Ciampino Airport is about 40 – 60 minutes pending traffic conditions. If you need to arrive at the airport 2 hours prior to your flight departure time, schedule your pick up at least 3 hours prior to your flight departure time to allow for travel from Rome to the airport. For transfers to Fiumicino Airport also be sure to include in your reservation or inform your driver of the Terminal Number your flight departs from. At FCO Airport airlines share multiple terminals for departure depending on various factors such as first destination city, code sharing, etc. Terminals can also change last minute. It’s important to know which terminal your flight will depart from in advance. 8 Include the Total Number of your Suitcases and Carry-ons in your Reservation. To ensure that you and your luggage will safely fit together inside the vehicle, it is important to include the total number of Large pies of luggage (checked in suitcases), and Small pieces of luggage (carry on cases). If you exceed the luggage capacity for the vehicle suitable or priced for the number of persons in your party, you may need a vehicle size upgrade, or a 2nd vehicle if you are a party of 7-8 traveling with more luggage than the minivan can accommodate. 9 Read the Information in the Website and Confirmation Email to Inform yourself about the Services you Book. Different companies in different countries operate by certain set of laws, regulations, and culture norms. Read the Terms of Service prior to placing your reservation so you know in advance what is included and what is not included in your transfer, payment and cancellation policies, and other important information. Assuming all companies in all countries operate the same only leads to disappointment during your travels. Also read the information available on the website prior to booking your transfers, and the confirmation email as well so you fully understand the type service you book and what to expect, know where to meet your drivers, emergency contact information, and the price of the service. If you experience changes in the number of passengers, arrival flight number or arrival time, your Hotel, or amount of luggage, please contact us so we can update your reservation with new information. Failure to provide the company with updated information may result in service not provided accurately. We hope this information helps you book your perfect Airport and Civitavecchia Transfers for stress free and seamless transfers. Thank you very much for choosing Stefano’s RomeCabs for your Transfers and Tours in Italy. We look forward to welcome you to Rome! Buon giorno and welcome to Stefano’s Rome Cabs, Rome’s leading company for private Transfers, Day Tours, and Shore Excursions from Civitavecchia, Livorno and Naples. Italy has an extensive train system that can take travelers to many popular destinations in Italy from Rome. One of these destinations is Civitavecchia, the cruise port about 1.5 away from Rome. The commuter train is the most common means to travel between Rome’s Termini Station and Civitavecchia Train Station (the 2 endpoints for this commuter train route). Assuming it’s an easy and cheap train ride between Rome and Civitavecchia, many cruisers opt for what would seem to be a convenient, reliable and inexpensive mode of transportation between Rome and Civitavecchia. It is true that it’s inexpensive at 5 Euros per person. But easy, convenient AND reliable? Thousands of cruisers left stranded did NOT find it reliable. Recently an unfortunate TRAIN STRIKE (trains and transportation strikes are common in Italy) left thousands of cruisers stranded either in Rome or in Civitavecchia unable to access the train they depended on for their transportation. Being stranded like this in a foreign country without a plan B to count on can be a frightening experience and one that can ruin your much anticipated cruise! Cruisers needing to travel to Civitavecchia Port to catch their ship were stranded in Rome scrambling for taxis or alternative options at costs they did not even imagine or prepare for! For families and friends traveling together with more luggage that could fit into a taxi car (most taxis in Rome are small fuel efficient cars, not large minivans suitable for parties of 3 or more with a lot of luggage) would require more than 1 taxi. Taking 2 taxis from Rome to the main gate of Civitavecchia Port (Rome taxis do not have access into the cruise port), it would easily cost 240 Euros or more!! And a ccording to many travelers, Rome city Taxi drivers are not known for honesty and fair competitive prices for the type of services they provide. Cruisers who were left stranded in Civitavecchia and needed to go to their Rome hotel post cruise or to the airport to catch a flight were left at the mercy of Civitavecchia Taxis available at the port. Civitavecchia Taxis are generally large minivans suitable for cruisers, but they do not have a set rate. Starting rate for a transfer from Civitavecchia to Rome or Airport usually starts at 200 Euros (or more, depending on demand according to some cruisers). On train strike days, it’s hard to find a Civitavecchia taxi available since those who disembark the earliest grab the available taxis and since it can take up to 3 hours for a taxi to return to Civitavecchia after dropping off clients in Rome or the Airport, it would be a long and unguaranteed wait. There are not that many Civitavecchia Taxis available. Cruisers who docked in Civitavecchia on a shore excursion and planned a DIY visit to Rome by train, found themselves stuck in port for the day. For a large number of cruisers, a visit to Rome was their once in a lifetime opportunity to experience the Eternal City. Arranging same day tours with tour companies in Rome is virtually impossible due to the complexity of arranging tours by car, and the distance from Rome (where most companies like us are basted) to Civitavecchia. As such, a common train strike in Italy caused thousands of cruisers to miss out on their much anticipated visit to Rome. A SIMPLE TRAIN STRIKE RUINED THE CRUISE FOR THOUSANDS OF CRUISERS! A simple train strike which happens quite often in Italy (and most cruisers are not aware of this or do not know how to check in advance for scheduled strike days) has ruined the cruise for thousands of Cruisers who opted to take the cheapest alternative of transportation and ended up stranded. “You get what you pay for, we tried to be penny wise but ended up Euro foolish when that 10 Euro train ride for 2 turned into 200 euro taxi misadventure”. WHO WERE THE HAPPIEST CRUISERS ON TRAIN STRIKE DAY? The happiest cruisers on the train strike day were those who booked private transfers and tours in advance and were not impacted by the train strike in the least. Our shore excursion clients went on to enjoy their Rome shore excursions like nothing had happened. Our cruising clients traveled to and from Civitavecchia on our private transfers in the comfort of their private deluxe vehicle just like any other day. Buon giorno and thank you for visiting our Stefano’s RomeCabs Transfer and Tour Blog. Our mission is to help turn your trip or cruise to Italy into the vacation of a lifetime! 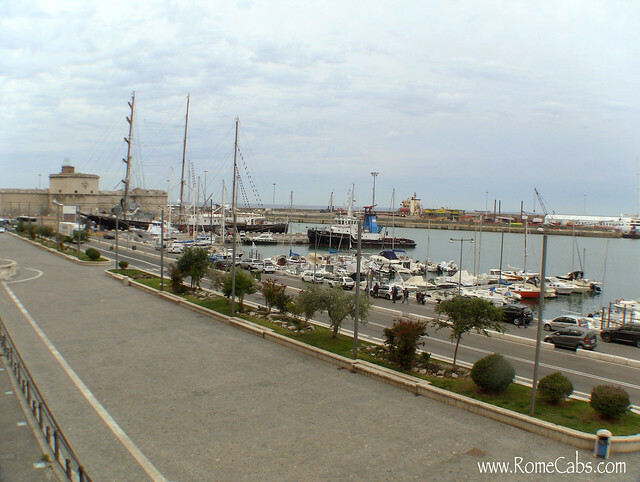 Civitavecchia is the main sea port of Rome on the Tyrrhenian Sea about 1.5 hours from Rome. Its name, Civitavecchia, means “the ancient village”, and it does have ancient roots as the modern town was built over a pre-existing Etruscan settlement and during the Roman times Emperor Trajan constructed a harbor in early 2nd century AD. Civitavecchia is also the “Port of Rome” serves as the primary cruise and ferry port with tens of thousands of cruisers leaving, arriving, or docking in Civitavecchia each month. If you are cruising and docking in Civitavecchia, there are so many opportunities for shore excursions in Rome and into the rustic and historic countryside not far from Civitavecchia. In this post we will offer you some of the most popular shore excursions into Rome and into the countryside offered by Stefano’s RomeCabs for your consideration for your future trips to Rome or shore excursions from Civitavecchia. Stefano’s RomeCabs’ private shore excursions are provided in your own private deluxe vehicle with your own personal knowledgeable English speaking driver at your disposal for an enjoyable fun filled excursion. Our classic Rome in Day From Civitavecchia Shore Excursion offers guests the opportunity to visit exciting monuments such as the Colosseum and Pantheon, explore the Vatican Museums, Sistine Chapel and St Peter’s Basilica, and enjoy the lively Trevi Fountain and Spanish Steps. Panoramic Rome for Cruises shore excursion offers cruisers a more relaxed and flexible tour of Rome with opportunities to experience Rome’s highlights while avoiding crowded tourist attractions with lengthy security lines and pricey advance tickets that leaves very little time for flexibility and last minute changes in travel plans. On this Panoramic Rome for Cruisers tour includes the following sites: The Pantheon, Piazza della Rotonda, the Trevi Fountain, the Spanish Steps, Piazza Navona, St Peter’s Square, Capitoline Hill with view of the Roman Forum, Colosseum Square, Basilica of San Clemente and Underground Rome. Rome was the last of the world’s grandest ancient civilizations that have profoundly impacted today’s architecture, engineering, politics, and entertainment as they left behind vestiges of their impressive achievements that can be enjoyed and admired today. The Seven Wonders of Ancient Rome includes: The Colosseum, Circus Maximus, Baths of Caracalla, Via Appia, Park of the Aqueducts, Pantheon, and Trajan’s Forum. Recommended by Travel + Leisure Magazine, Stefano Rome Tours’ Vacanze Romane / Roman Holiday Shore Excursion takes you on a journey through the Rome following many of the popular sites featured in the classic film starring Audrey Hepburn and Gregory Peck. The sites in the Vacanze Romane tour includes the following exciting places in Rome: the Colosseum, drive through Piazza Venezia, view the Roman Forum from Capitoline Hill, the Mouth of Truth, view Castel Sant’Angelo with its beautiful bridge Ponte Sant’Angelo, Trevi Fountain, Spanish Steps, Via Margutta and the Pantheon. Angels and Demons tour by Stefano Rome Tours is based on Dan Brown’s novel and film Angels and Demons and takes you on a spectacular day in Rome following the path of the Illuminati in the footsteps of Robert Langdon: Castel Sant’ Angelo, Santa Maria del Popolo Church, Santa Maria della Vittoria, the Pantheon, Piazza Navona, and the Vatican. Stefano’s RomeCabs popular Countryside Splendor Shore Excursion from Civitavecchia takes you into the heart of the Roman tranquil countryside. On this tour will have the opportunity to experience the beauty, charm, and wonders of 3 of Italy’s most profound eras: The opulent Renaissance Era with a visit to the imposing Bracciano Castle that overlooks the pristine volcanic Lake Bracciano, lunch in the Medieval hamlet of Ceri where time seems to have stood still for 1,000 years, and the Etruscan Civilization as you explore the numerous ancient tombs inside Cerveteri Etruscan Necropolis of Banditaccia. The Etruscan Mystery Shore Excursion from Civitavecchia with Stefano Rome Tours takes you on a historic journey into the heart of the Roman countryside to experience one of world’s most fascinating and advanced ancient Pre-Roman civilizations: the mysterious Etruscans. On this tour you will have the opportunity to visit Tarquinia and explore the ancient Monterozzi Necropolis with a dozen of beautifully frescoed underground tombs depicting scenes from everyday lives of the ancient Etruscans. A UNESCO World Heritage Site, there is simply nothing in the world like the Etruscan tombs in Tarquinia. With all these options to choose from, you are sure to have an amazingly unforgettable shore excursion from Civitavecchia…and if there are more than 1 tour you are interested in, these tours are also offered as Day Tours from Rome if you will be spending time in Rome before or after your cruise, or as as Post Cruise Tour starting from Civitavecchia and ending at your hotel in Rome. Thank you very much for choosing Stefanos’ RomeCabs for your Transfers and Tours in Italy. We look forward to showing you beautiful places! Buon giorno and welcome to Stefano’s RomeCabs, Rome’s leading company specializing in private Civitavecchia Transfers, Airport Transfers, Day Tours, and Shore Excursions from Italy’s top cruise ports. For more than a decade Stefano’s Rome Cabs has been been renowned for providing quality transfers and affordable competitive prices, dependability, and exceptional customer service putting our clients FIRST. Our company offers visitors to Italy private Airport Transfers from Fiumicino Airport and Ciampino, Transfers to and from Civitavecchia, Sightseeing Transfers between Italy’s top cities, and Transfers all around Italy upon special request. Stefano’s Rome Cabs offers transfers between Rome accommodation and the airports that serve the region: Fiumicino Airport (the main International airport also known as Leonardo da Vinci Airport) and the smaller regional airport in Ciampino that serves smaller European carriers that fly between European countries. Booking your Airport Transfers online through our website at www.RomeCabs.com is easy, secure, and reservations confirmed within 24 hours of receipt of reservation request. For more information about our Airport Transfers, click HERE. In our Airport Transfer confirmation email, we provide our clients with all the necessary information for their Airport Transfer. Our fun to watch video How to Meet Your RomeCabs Driver at Fiumicino Airport helps our guests prepare for their arrival in advance. Stefano’s’ RomeCabs offers private transfers between Civitavecchia Cruise Port and Rome as well as Fiumicino Airport. All our drivers have the licenses and security clearances required to access Civitavecchia Cruise Port to conveniently drop off and pick up our clients right on the pier next to their shop for an easy and relaxing transfer to or from your cruise ship. Would you like the upgrade your Civitavecchia Transfers and enjoy more of Rome or the countryside on your way to or from your cruise ship? Stefano’s RomeCabs also offers popular Pre-Cruise Tour and Post-Cruise Tour options for cruisers who wish to enjoy some additional sightseeing instead of just a non stop direct Civitavecchia Transfer. Stefano’s Rome Cabs also offers our guests Sightseeing Transfers in Italy that includes long distance transfers between Rome and Florence, or between Rome and Sorrento / Amalfi Coast, with a visit to one or more top destination towns to turn your long distance transfer into a fun filled day tour. Stefano’s RomeCabs can also arrange customized long distance transfers throughout Italy to where it’s more convenient, easy and efficient to travel by car than by train. Let us know how we can assist you with your Transfer needs in Italy. We’d like to invite you to also visit our sister company Stefano Rome Tours for more exciting Tours and Shore Excursions in and around Rome: www.StefanoRomeTours.com. We are at your service to make your trip to Italy as enjoyable and carefree as possible! Thank you very much for reading our Transfers in Civitavecchia, Fiumicino, Around Italy with Rome Cabs blog, we look forward to welcome you to Italy! CIVITAVECCHIA TRANSFERS – HOW TO MAKE YOURS EVEN BETTER! .Buon giorno and welcome to Stefano’s RomeCabs Travel Blog. Our goal is to provide our clients with easy, affordable, reliable and comfortable private transfers to and from Civitavecchia Cruise Port. Whether you are traveling between Fiumicino Airport and Civitavecchia, or between Rome and Civitavecchia, our private transfers with door to door service will deliver you and your luggage swiftly and efficiently to your final destination. As if having your private driver at your disposal, driving in the comfort of your private deluxe vehicle, never lifting your luggage, and travel relaxed and comfortable is not perfect enough…. we’d like to make your Civitavecchia Transfers even better by enhancing your transfer with sightseeing opportunities along the way. HOW TO MAKE YOURS EVEN BETTER! For Rome lovers and cruisers who are only in Rome for short time (such as arriving in Rome the day before they sail on their cruise), we offer the very popular ROME PRE CRUISE TOUR that takes you on a half day tour of some of Rome’s top highlights, and then transfer to Civitavecchia. Touring Rome by car is relaxing, you maximize your sightseeing possibilities by being able to see more, enjoy sites of your choice that are best accessible by car (our private Pre Cruise tours can be customized to suit your preferences), and have your luggage with you so you don’t have to worry about returning to your hotel at the end of your tour. On your Rome Pre Cruise Tour you can enjoy either the Colosseum or the Roman Forum (the same tickets are valid for either site), the ancient Pantheon, the Spanish Steps, Trevi Fountain, and give Rome a proper “arrivederci” with a visit to Janiculum hill for an unforgettable sweeping view of Rome from a special terrace on the top of the hil.. If you’ve already seen Rome’s highlights and prefer to start off your cruise with a relaxing countryside tour, Stefano RomeCabs offers a fabulous countryside tour that takes you one of Rome’s most pristine lake, visit the formidable Renaissance Bracciano Castle, and enjoy a traditional lunch in the Medieval hilltop village of Ceri for a fairy tale countryside escape. Odescalchi- Orsini Castle (commonly referred to as Bracciano Castle) is an imposing 15th century fortress that was later converted into a residential castle. For centuries, the castle is still owned by the Odescalchi family. The Castle is open to visitors to explore the opulent Renaissance rooms where Kings, Queens, Lords, Ladies and Popes have lived and slept, and explore the castle grounds. Not to be missed is the breathtaking panoramic view of the pristine Bracciano Lake that is actually a volcanic crater! Nearby in the midst of the rustic countryside is the medieval clifftop hamlet of Ceri, a 13th century fortified fortress that is now a charming tiny village with a remarkable church: Sanctuary of Mary of Ceri that boasts an incredible wall with medieval era frescoes depicting biblical scenes. Ceri is also best regarded for the local family owned restaurants that draws patrons from all across central Italy, including many of our international clients who request a visit to Ceri just to have lunch there! If you thought just having a private transfer to Civitavecchia was great…. Now you have 2 new options to transform your transfer into Pre Cruise Tour and get your cruise off to a fabulous start! Thank you very much for choosing Stefano’s RomeCabs for your private Civitavecchia Transfers, Day Tours and Shore Excursions in Italy. We are at your service to make your holiday in Italy your best ever!